"O woe, truly I am being destroyed! ", cries out Hades..."
"O woe, truly I am being destroyed! 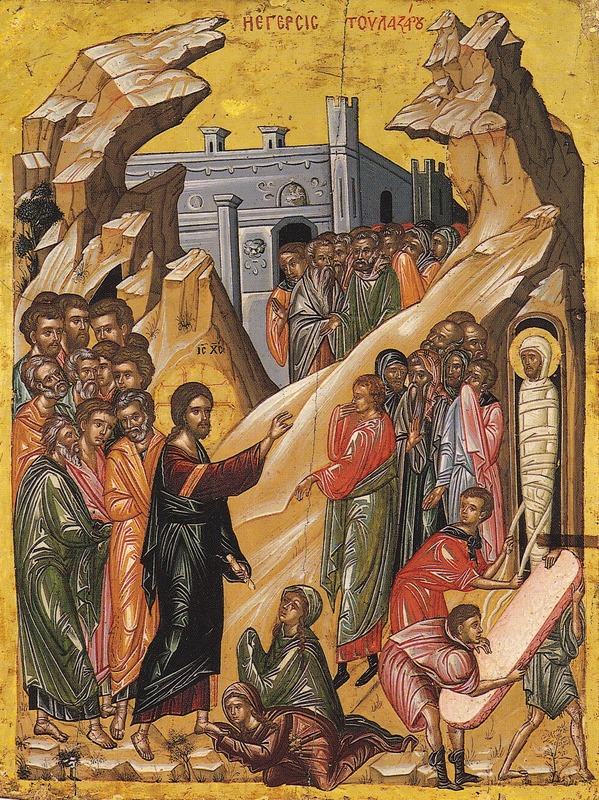 ", cries out Hades, which speaks to Death saying: "Behold, the Nazarene makes the things below tremble, and rents apart my belly, raising the speechless dead man with His voice." "I see you now as a greatly-bright lamp..."
I see you now as a greatly-bright lamp founded by God, as a golden Ark of the Law that is passing. 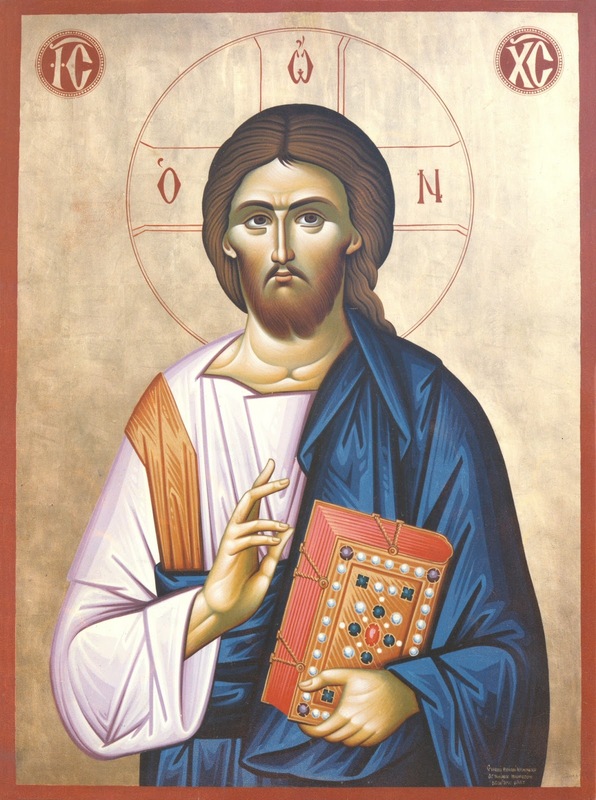 Receive, O All Spotless One, Him Who was well pleased to deliver the corrupt nature of mankind through you. "The door of the Kingdom is already open..."
Christ became man and called to repentance robbers and harlots. Repent, my soul! The door of the Kingdom is already open, and the transformed pharisees, publicans and adulterers are seizing it ahead of you. Elder Ephraim of Arizona: "Carry your cross with patience and joy"
About the grief that torments you, I have told you many times that it is your cross which our Jesus has given to you so that you may become an imitator of Him and not be a stranger to His love. 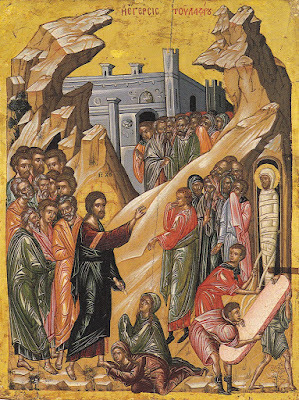 For whoever loves Him sincerely follows Him not only to Mount Tabor, where the glory of His divinity appeared (in other words, not only at the time of His visitation through His sweet grace and joy ), but follows Him also on the uphill climb to Golgotha and His Crucifixion (in other words, also in the absence of His grace and in sorrowful occurrences, which produce distress, pain, despair, perplexity, labor, and sweat). Precisely then is the inner man tested and it is revealed what he is: counterfeit or true, skilled or unskilled, captain or sailor. Precisely then are our intentions tested, and he who is courageous and patient is rewarded internally by the visitation of God through the increase of grace. In this manner, the Christian is trained in the spiritual struggle until he reaches the end and finds rest. Struggle philosophically; carry your cross with patience and joy until you bring it to the Place of the Skull, to the tomb, so that our Jesus may give you the resurrection! He who bears his cross for the love of Christ will be raised by the Lord on the last day. How long will our life be? The time of our death is unknown, whereas patience will be rewarded eternally. This cross of grief you are bearing has already given you very much, and how much more it will give you! And yet you do not see this, for God wisely hides it from you for your benefit. Entreat God continuously to give you patience, and thank Him with knowledge; then you will be able to endure ioyfully, awaiting your salvation through these afflictions. 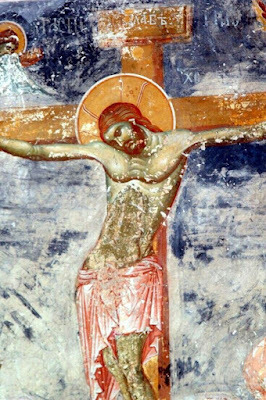 Elder Symeon Kragiopoulos: "The Cross is glory for Christ." Only God knows what every one of us should go through. And not only should we get prepared for it but also look forward to it with joy. Because this is our glory. The cross is glory for Christ. Similarly, for the men of God any given suffering, any given injustice, any given pain for the love of God, is glory, too. Brethren, I want you to believe me. Some of us may have a “but” inside them; this is no good. You may have the worst of the things, be it hereditary or of a different cause. In the long run, it will be to your benefit, if you take things the right way. If your complaint and tantrum get out of the way, if, these go, and I mean the very fact that you put the blame elsewhere, humility and salvation come. Why do you put the blame of your condition on something else? Because you want to salvage your ego and you don’t even realize it. Some people have been so utterly devastated in this life, that they believe they have no pride. Yet, precisely their stubbornness, their state of non-repentance, their complaint, their conviction that it’s somebody else’s fault, reveals a fierce ego, an ego without humility. As soon as we become humble, as soon as we get rid of whatever grudges we may be bearing, as soon as we repent, salvation instantly comes. Man is saved. These words are true. Elder Nikon of New Skete: "If Christ benefited from fasting, then I will fast too!" “When man practices asceticism, the devil often gets in over his head. Because he knows what a weapon the fasting is! What power the fasting has! That is why, during the fasting seasons, during the Great Lent, Dormition Fast and now in the Nativity Fast, which is an easy fast, the devil is getting crazy seeking to destroy our fast by determining us to argue with each other, determining us to judge, to look at what the others are doing to lose the reward we will receive from God for fasting. During the fasting seasons we should be more cautious, more vigilant, in a deeper state of awakening and more prayer. Let the fast be not only of our stomach! Let it be of our eyes also, for the ears to fast from what they hear, and the tongue to fast from what it says, to fast from everything! Let us fast, but know that because we will make the devil to suffer, he will attack us! Do not worry at all about this! He can not do anything! If he could, then he would! And if you hear a smart one telling you that Scripture says that it is not a sin what goes into the mouth, but what comes out of it, what he or she says, that it is important, as Christ says, and not what you put into your mouth. And they want to say, using the Christ’s words, that fasting is not necessary, because Christ Himself said that what comes out of your mouth, that will condemn you, not what you put into your mouth. If somebody tells you such a thing, tell him or her too: If Christ benefited from fasting, then I will fast too! If I will perform more miracles than Christ, then I will immediately interrupt my fasting. Meanwhile, if He benefited from fasting, then I will benefit even more! 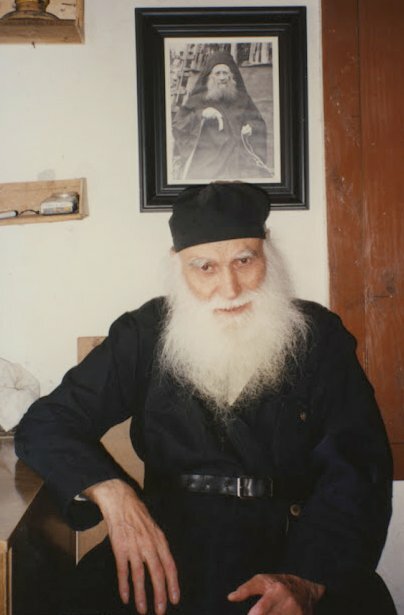 Note: This year marks 20 years from the repose of blessed Elder Ephraim of Katounakia, a great figure of Orthodox Athonite Monasticism of the 20th century and spiritual descendant of Elder Joseph the Hesychast. May we have his blessing and follow his life, example and teachings, and may he intercede for us to the Lord! Fr. 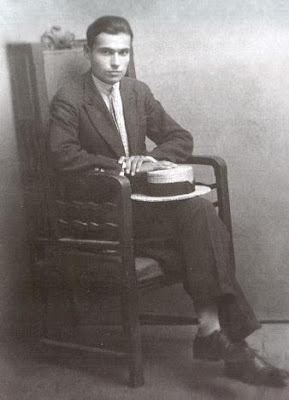 Ephraim of Katounakia was born in 1912 in Ambelochori, Thiva (Greece). His father was named Ioannis Papanikitas and his mother was Victoria. The Elder's worldly name was Evangelos. He completed high school, but the Grace of God closed off to Evangelos the worldly paths of waywardness. In Thiva, where his family moved to, Evangelos came to know his later Elders, Ephraim and Nikephoros. The life of Evangelos was monastic. He struggled spiritually with the Jesus prayer, with prostrations, with fasting, but especially with obedience. His mother was made worthy to receive from St. Ephraim the Syrian the knowledge that it was his desire that his son become a monk and that Evangelos would keep the monastic life. 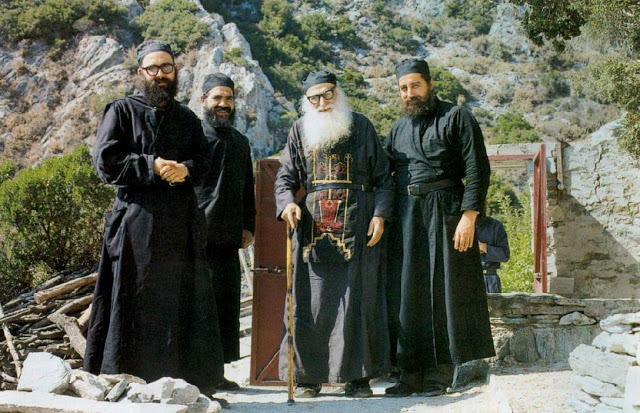 On September 14th 1933, Evangelos left the world and came to the desert of the Holy Mountain at Katounakia, to the hesychasterion of St. Ephraim the Syrian, and made his prostration to the synodeia of the Elders Ephraim and Nikephoros. After the trial period, he was tonsured a monk of the small schema with the name Longinos. 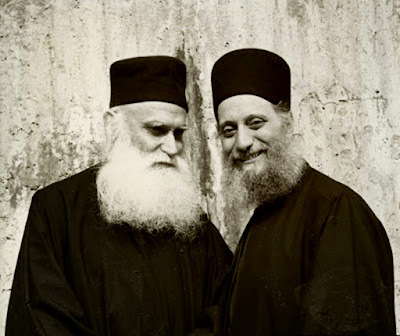 In 1935 he became a great schema monk from his Elder Nikephoros and received the name Ephraim. The next year he was ordained a Priest. Papa Ephraim was made worthy to know the great rector of the hesychastic life, the discerning and foreseeing and holy Elder Joseph the Hesychast (1898-1959), and became united with him spiritually together with the blessing of his Elder Nikephoros. 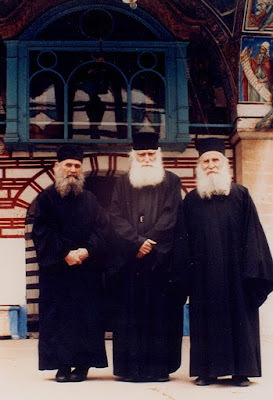 Elder Joseph, over time, taught him the un-deluded spiritual life from the famous hesychasts, monk Kallinikos and Hieromonk Daniel. 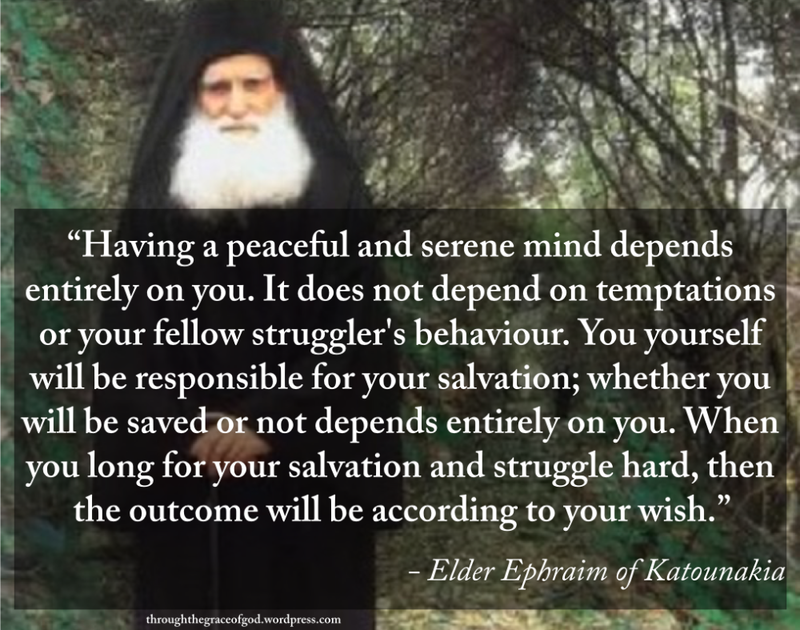 Later, Papa Ephraim taught us the persistent search for the spiritual life and finding an un-deluded and simple spiritual guide, who would be an act of the proper Orthodox faith. The un-deluded spiritual father sees the demonic traps and with corresponding medicine leads the spiritual children to Paradise. 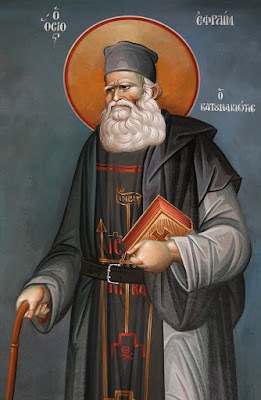 Blessed Papa Ephraim distinguished true from sick obedience when he counseled a monk of a cenobium to show obedience to his Elder not like an animal, but from love and zeal for God. 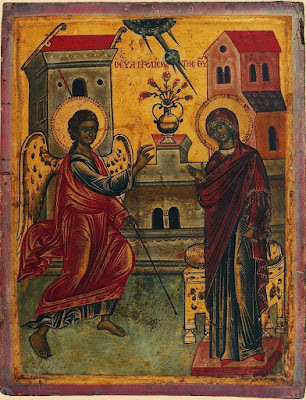 The holy Elder Joseph the Hesychast gave a program of the hesychastic life to Papa Ephraim, in order to cultivate the prayer: "Lord Jesus Christ, Son of God, have mercy on me", to keep watch over his senses and to lead him towards purification of the heart and divine illumination. Papa Ephraim, with the blessing of Elder Joseph, was nourished by the "Philokalia of the Holy Neptics", and received the counsels of the Neptic Fathers regarding his struggle. He did not read psychiatric books, nor cultural books on the spiritual life that people keep in the living rooms, nor did he have the fear that he would be included in the circle of "fundamentalism" by worldly people. In 1973, Hieromonk Nikephoros, his Elder reposed. 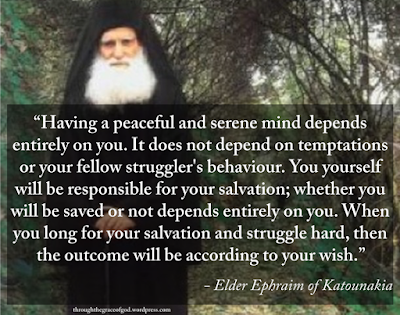 After 1980 the Elder had gathered a synodeia around him and kept the commandment of Elder Joseph to keep a synodeia after the death of Papa Nikephoros. Later, Papa Ephraim reached purification and became that very Elder. Papa Ephraim fought the great enemy of the spiritual life, kenodoxia (vainglory). His sacrifices were for Christ, and not to seek the praise from men. The Divine Liturgy for Papa Ephraim was astounding and experiential event. He secretly related to a Hieromonk spiritual friend of his that from the first Divine Liturgy that he celebrated, he saw sensibly the Grace of God transform the divine Gifts. Of course, after the sanctification of the Precious Gifts, he saw Christ Himself on the Holy Paten, and it was impossible for him to hold back his tears, when he broke apart the Body of Christ. His tears watered the antimension, and to the right and left he saw Angels serving with him. However, Papa Ephraim never sought "liturgical renewal", and in fact, he asked those in cenobiums in the outside world who were at outside diakonemas to not abandon the Psalter. Papa Ephraim was adorned with the gift of discernment, and saw the spiritual state of every cleric or monk and granted the corresponding medicine for their progress in the spiritual life. The Grace of God had granted Papa Ephraim the gift of foreknowledge, and because of this, he saw situations that would occur beforehand (such as the earthquake of 1977 in Thessaloniki), and also many times he had called lay people, even from their childhood years, by the name that they would later receive in their monastic tonsure. For example, a student sent a general letter to the blessed Elder without details, and he received a response from Papa Ephraim which related details of his spiritual state and the situation of his village without the student having told him anything beforehand. Once, some clerics who did not know each other met on the road to Katounakia, and when they reached Papa Ephraim, the blessed holy Elder began to berate one of the clerics, saying that he was not a priest but a mason, who took off his raso, in order to spy on the Holy Mountain. The mason acknowledged his plan. Papa Ephraim lived experiences which only Orthodox Christians could experience, far away from papist or protestant delusions. 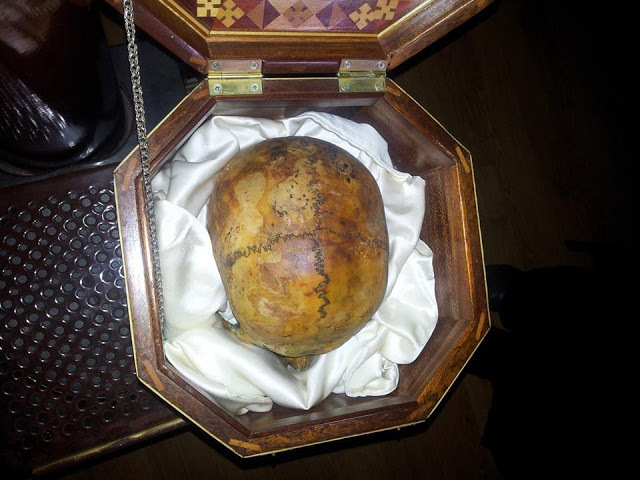 Once, an Abbot, two theologians and a student asked Papa Ephraim to describe the fragrance of holy relics. The Elder bent his head to the side of his heart and prayed. The place was filled with fragrance and Papa Ephraim told them that because he could not explain it, he entreated God to respond to those he was speaking with. Papa Ephraim sensed sins as stench. Once, a bishop through a third party asked the blessed holy Elder about ecumenism. The Elder prayed for God to inform him, and then he sensed a stench with a sour, salty and bitter taste, which filled him with dismay. 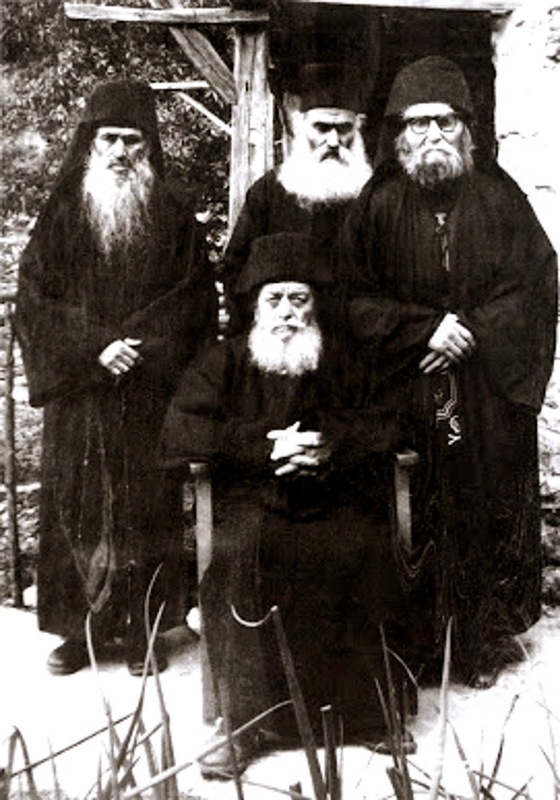 The Depository of the blessed Papa Ephraim on the unity of the Orthodox was clear: "Schism occurs easily, but unity with difficulty." So, how much do the words of a modern-day God-bearing Father resonate today? 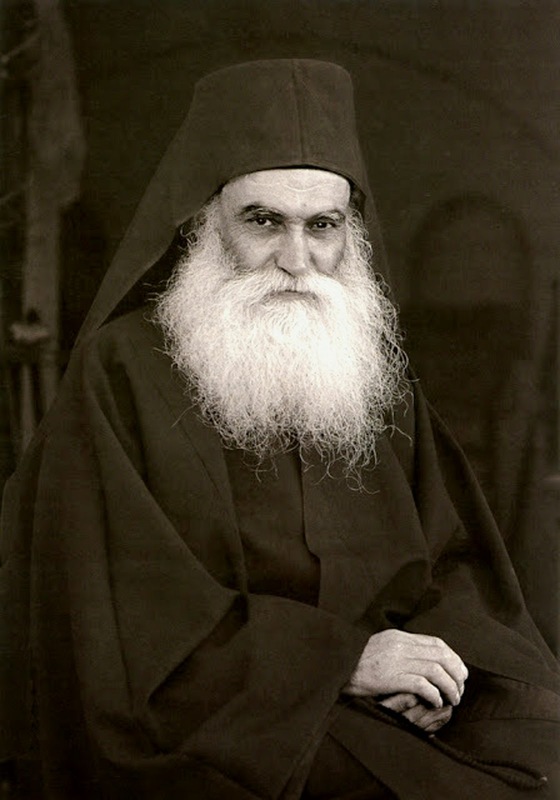 Papa Ephraim was highlighted by the Grace of God as a practical guide in the pastoral care of marriage and family, because he helped many young people to embrace marriage without forcing them, and because of this, his letters which have survived comprise a spiritual depository of "parental education", without psychological or philosophical theories for struggling spiritual families. In 1996 Papa Ephraim suffered a stroke and remained paralyzed. He did not complain at all but glorified God. He leaves us his holy paradigm on how to face afflictions. On February 14 / 27th 1998 Papa Ephraim of Katounakia and Mount Athos delivered his holy soul to the hands of his Creator, Whom he served from his youth. It was said of a very old man who lived in the 19th century, that he was asked what was the most astonishing moment of his life. He responded that when he was small, he saw and heard St. Kosmas Aitolos. And our generation was made worthy to know the fragrant flowers of Athonite Monasticism, St. Paisios and Papa Ephraim of Katounakia, who call us to follow their life's example. "Our hearts became one, and met like two flames rising up to heaven!" "Yeah sure, a priest like the others came to talk about prayer! With ironed raso and shirt! Come on, I'll give him a loukoumi so he'll leave!" 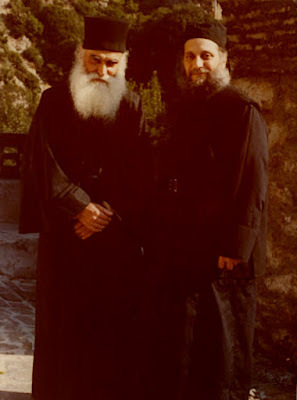 Elder Aimilianos, as he was good natured, pleasant and radiant, out of reverence took off his skoufo (hat), and sat respectfully in front of Elder Ephraim. "I am an Abbot in Meteora", he said. He appeared to come with longing to speak with Papa Ephraim on noetic prayer, the monastic life, and its fruits, in general. "At Meteora you have a lot of people" replied the Elder, perhaps still having some doubt regarding that unexpected visitor. "You should come to the Holy Mountain", he preferred to say. Something, however, warned Papa Ephraim within him that he somehow misjudged the young Abbot from Meteora, who, after all, had worked hard, together with two others, to come meet with him. "Maybe I am being unjust to the man?" He said within himself. He went to bring him a loukoumi for a treat, while within he was pressured and had very serious doubt. "Why don't I get information" in order to be sure. His "Information" [from God], was for the Elder a way and path of life. Papa Ephraim went into his chapel, to the icon of Panagia in order to get "information" on Fr. Aimilianos, the "selfish muse fire outside, the amorphous one from Meteora". 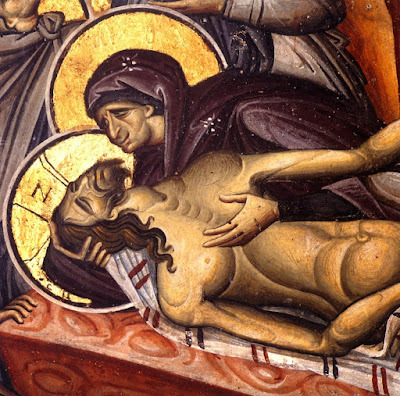 Papa Ephraim made two, then three prostrations, and said straightaway with honor to the Theotokos: "My Panagia, should I speak with him, or will I waste my words?" "You have found a second Elder Joseph [the Hesychast]. Speak with him!!" She said. Papa Ephraim arose, sweating and astonished! "O! I'm crying within myself!!" He said with astonishment. He ran outside, took Fr. Aimilianos and led him into the chapel. They talked for hours between them, and from then on, they were never separated. 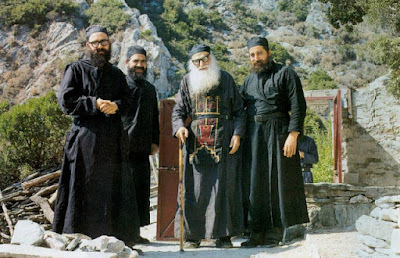 Papa Ephraim continuously said of that man planted by God at Meteora: "I found my departed Elder, another Elder Joseph, the golden-tonged and honorable Elder Aimilianos!" 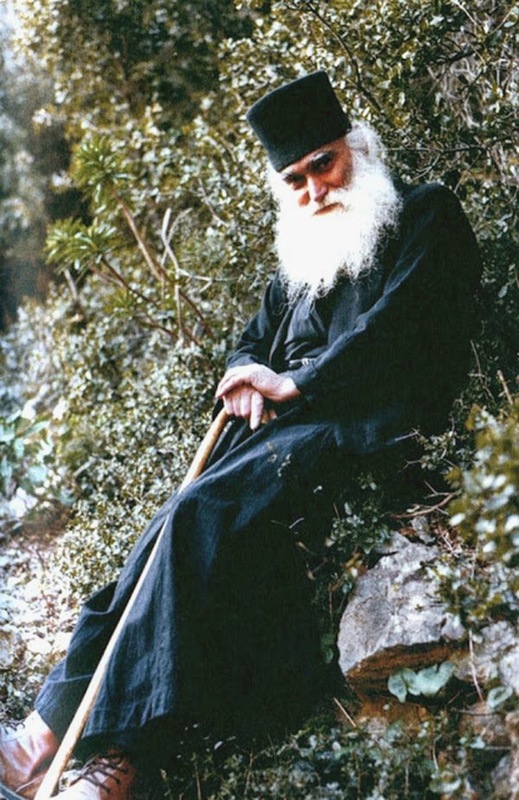 Elsewhere, he said of Elder Aimilianos: "He, my child, is fragrance." Everyone has a cross to carry. Why? Since the leader of our faith endured the cross, we will also endure it. On one hand, the cross is sweet and light, but, on the other, it can also be bitter and heavy. It depends on our will. If you bear Christ’s cross with love then it will be very light; like a sponge or a cork. But if you have a negative attitude, it becomes heavy; too heavy to lift. Prayer is a struggle. It strengthens the fight of the faithful against the devil but it is itself also a painful and bloody struggle. All our effort is to concentrate our nous on the words of the "Jesus Prayer." We should make our nous deaf and mute to any other thought, either good or bad, that evil brings us. We should not listen to the thoughts that come from outside or answer them. We need to despise them completely and not converse with them. Thus we should seek in every way the complete muteness of our nous because only with this action can we keep our soul in calmness so that the Jesus Prayer can act effectively. 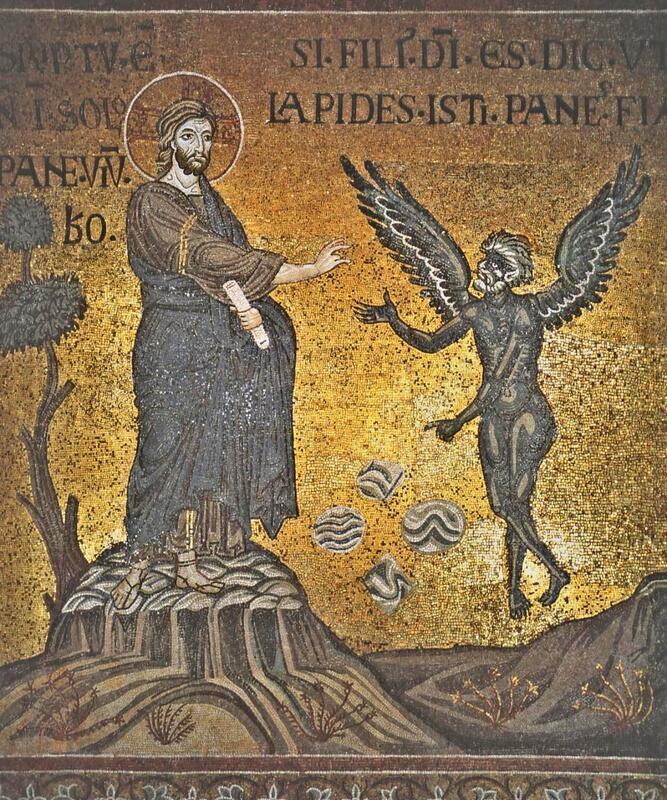 The Holy Fathers teach that even if man is not always under the dominion of the demons he is, however, under their influence and persistent hostility. They continually turn around the soul and try, by all means, to make the faithful sin, either through the senses (when the object is near) or through the imagination (when the person or object is far away) or through the movements of the flesh. For the whole of man, who consists of soul and body, receives the influence of Satan and gets captured by him. The hostile tactics of the evil, however, are more apparent during prayer. Those who fight in this inner struggle see evil making war against them furiously at every step. They see the devil clearly using all means to distract their nous from God. They see all the cunning devices of the evil demon, who hates the good and kills man. Imagination is the most cunning weapon of Satan; imagining the past and imagining the future; imagining good works, imagining bad ones. Various thoughts come and preoccupy the nous, so that it ceases to meditate on the name of Jesus. He tries to make man not to show interest in God and express his love. Primarily he coaxes him to call to mind the various faults he has committed in his former and recent life. The Holy Fathers say that the war is usually as fierce as the passions were before. For every pleasure he must pay the proportionate pain. There is a close connection between pleasure and pain in the ascetic life of the Fathers. Pleasure brought about both the Fall and pain; and it is precisely this pain which restores man to his original state and cures him. Thus, man suffers a lot. He pays for each thought and evil pleasure the proportionate amount of suffering, so that an equilibrium may be restored. Events that happened many years ago which he felt pleasure for, being forgotten in the meantime, appear now in all their intensity and range. He may even reach the point of disgust and despair. The best prayer is the one you say with your own words. Reading a prayer is not enough. For example, before receiving Holy Communion we read the Service of Preparation for Holy Communion, ‘From lips tainted and defiled, from heart unclean and loathsome…’, sometimes without even understanding the words. You yourself should pray with your own words. Then you will understand what you are saying to God. This prayer has great power; great power indeed! and on obedience to the confessor, even for laymen.